The No. 2-seed Los Angeles Rams look to atone for last year’s postseason flop when they host the NFC East champion Dallas Cowboys in a Divisional Playoff on Saturday. It’s an 8:15 p.m. ET kickoff from Los Angeles Memorial Coliseum. The Los Angeles weather has been wet ahead of kickoff, with rain falling throughout the day, but conditions should dry out by kickoff. The Rams lost 26-13 at home to the Falcons in last year’s playoffs, abruptly ending a breakthrough season. Now they host a streaking Cowboys team that has won eight of nine and can play shut-down defense. Sportsbooks peg the Rams as 7-point favorites, with the over-under listed at 48 in the latest Rams vs. Cowboys odds after the total climbed as high as 50. Before you make any Cowboys vs. Rams picks, see what SportsLine’s No. 1 NFL expert, R.J. White, has to say. White went a perfect 4-0 against the spread on Wild Card Weekend, including nailing Dallas (-1.5) against the Seahawks. He also has an uncanny feel for the Rams: In his past 24 against-the-spread picks involving Los Angeles, White has been right 19 times. Moreover, White is on a sparkling 55-31 roll on all his NFL picks, returning nearly $2,100 to anyone following them. This is the same expert who has cashed big in last season’s Las Vegas SuperContest, tying for 18th out of 2,748 contestants with a 52-29-4 mark against the spread. Anyone who has followed him is way up. Now, White has broken down Rams vs. Cowboys (stream live on fuboTV) from every angle and locked in a strong pointspread pick. He’s sharing it over at SportsLine. White knows the first-round bye came at an opportune time for the Rams, who had an opportunity to rest star running back Gurley (knee), who has been removed from the Rams’ injury report leading up the NFL Divisional schedule. C.J. Anderson, signed off the street earlier this season, was impressive in Gurley’s absence, piling up 46 carries for 299 yards and two touchdowns over the last two weeks of the season. 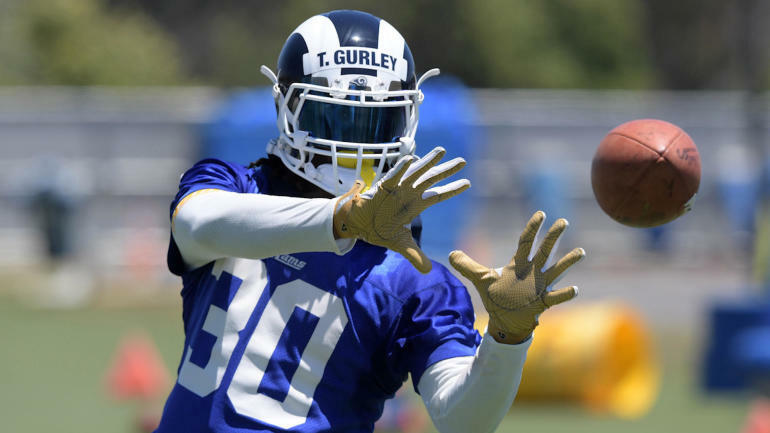 Gurley is expected to get the vast majority of the work on Saturday, but expect Sean McVay’s innovative offense to find ways to utilize both players against the Cowboys. The Rams had the league’s most efficient offense at home this season, while Dallas was just 3-5 straight-up on the road this year. And L.A. is coming off two easy covers, winning by 22 as two-touchdown favorites against the Cardinals and winning by 16 as 10.5-point favorites against the 49ers without Gurley in both games. But just because the Rams are a rested powerhouse doesn’t mean they’ll cover a touchdown against the streaking Cowboys. White knows the Cowboys are well-equipped to stop Gurley and make the Rams one-dimensional. They stuffed Seattle’s top-ranked ground game last week, holding the Seahawks to 73 rushing yards on 3.0 per carry. Dallas ranks sixth in scoring defense at 20.3 points per game and limited the high-flying Saints to just 10 points in a primetime game earlier this season. Rookie linebacker Leighton Vander Esch racked up 140 tackles, while defensive end Demarcus Lawrence was a one-man wrecking crew with 10.5 sacks, two forced fumbles and an interception. Behind NFL rushing leader Ezekiel Elliott, the Cowboys have covered six of their last eight games versus NFC foes. And they’ve won three of their last four road games outright. Dallas is 9-6-2 against the spread this season, compared to 7-7-2 for L.A. They’re 6-3 as a road underdog. Dallas has exceeded oddsmakers’ expectations all season. The Cowboys are 9-6-2 against the spread overall and 6-3 as an underdog or pick’em. They’re 3-1-1 against the spread versus teams like the Rams that win more than 55 percent of their games. We can tell you White is leaning under, but he has unearthed a critical x-factor that causes one side of the spread to hit hard. He’s only sharing what it is, and who to back, at SportsLine. Who wins Cowboys vs. Rams? And what critical x-factor makes one side of the spread a must-back? Visit SportsLine now to see which side of the Rams vs. Cowboys spread you need to jump on, all from the sizzling expert who’s 19-5 on Rams picks and went a perfect 4-0 on Wild Card Weekend.